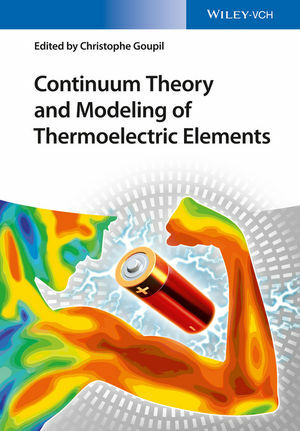 Sound knowledge of the latest research results in the thermodynamics and design of thermoelectric devices, providing a solid foundation for thermoelectric element and module design in the technical development process and thus serving as an indispensable tool for any application development. The text is aimed mainly at the project developer in the field of thermoelectric technology, both in academia and industry, as well as at graduate and advanced undergraduate students. Some core sections address the specialist in the field of thermoelectric energy conversion, providing detailed discussion of key points with regard to optimization. The international team of authors with experience in thermoelectrics research represents such institutes as EnsiCaen Université de Paris, JPL, CalTech, and the German Aerospace Center. Christophe Goupil is professor at the Ecole Nationale Supérieure d'Ingénieurs in Caen, France. His research interest spans from experimental studies of vortices in the so-called high-Tc superconductors to theoretical thermodynamics. Professor Goupil has extensive experience in collaborative research with industrial partners, including major energy suppliers and companies of the automotive industry. He holds several patents. As expert in thermoelectric systems and thermodynamics of thermoelectricity, Professor Goupil currently pursues and develops his research activities at the Laboratoire Interdisciplinaire des Energies de demain at the Paris Interdisciplinary Energy Research Institute.